What are the dates of the field school? 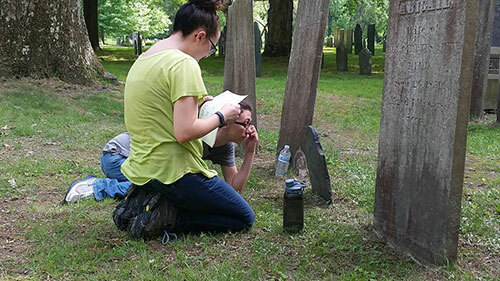 The field school runs for six weeks, most often during UMass Amherst's Summer Session 1. The dates for the 2018 field season are May 21 to June 29. Do I have to attend for the full six weeks of the season? Given the structure of the course, students are required to attend for the entire duration of the field season. If there are special circumstances that require you to miss a day, please inform the staff ASAP. Can I take the field school for reduced credits or simply volunteer? Unfortunately, UMass Amherst policy does not allow us to enroll students for anything less than the full six credits. The cost of attendance goes towards university administrative fees, equipment for the season, and instructor summer salaries. What are options for housing? Many students choose to live on campus for the duration of the field school. UMass Amherst offers on-campus housing for students enrolled in summer courses. Other students have found success living off-campus as well. More details about housing will be provided with your acceptance letter. I recently graduated with my undergraduate degree. Am I still eligible to apply? Absolutely! We have had many students who have graduated prior to the start of the season. However, you are required to attend for the full six weeks so please be aware of graduation date conflicts with the field school. I am in a field unrelated to anthropology. Can I still apply for the field school? We welcome applicants from many different fields! In past seasons, we have had diverse candidates such as military members, forensic artists, mathmeticians, human rights advocates, and others. I'm an international student. Will that cause issues with my application? International students are definitely welcome to apply for the field school and we will work with you to get your paperwork processed. International and immigrant students living in the U.S. may wish to read the UMass Amherst Chancellor's Commitment to Protecting the Rights of Immigrant and International Students. I'm a member of the LGBTQIA+ community and have concerns about health and safety that prevent me from attending more remote field school programs. Is this program safe for me? Yes. The UMass Amherst campus and surrounding towns of Amherst and Northampton have a vibrant and supportive LGBTQIA+ community and the field school often coincides with Northampton Pride. University Health Services has staff who are specifically trained about trans health issues and Machmer Hall, where the classroom portion of the course is taught, has gender-inclusive restrooms. Does the field school require strenuous labor? Yes. The second portion of the field school is conducted at our Taphonomic Research Facility from 8am to 5pm where students spend the entire time outdoors excavating. The TRF is located in the woods and we continue excavations rain or shine. If you have particular concerns about the physical labor required, please contact the instructors at bioarch@umass.edu. For more updates and journals from the current excavations, visit the UMass Bioarchaeology and Forensic Anthropology Facebook page.